A very good way to keep your kids happy and active is to get a kids garden slide. Not only will it help them stay active and healthy but it’ll keep them entertained. It can be used on just a normal day or when you’re having a BBQ and want to keep the kids occupied somehow. There are alternative ways to keep your kids active in the garden such as buying a bouncy castle, but it costs more money and requires more space, therefore a kid’s garden slide would be perfect for those on a budget or limited on space. 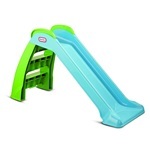 There are several features you should look out for when deciding on which one is the best kid’s garden slide. We’ve listed all the applicable features below with the factors to consider. Recommended age – Manufacturers have to state a recommended age, although this is a guideline only. If you feel your child would be safe using an outdoor garden slide then you can do so based on your own judgement. 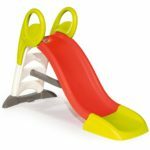 Foldable – A foldable garden slide is perfect if you’re limited on garden space or if you just prefer not to leave the slide out overnight. 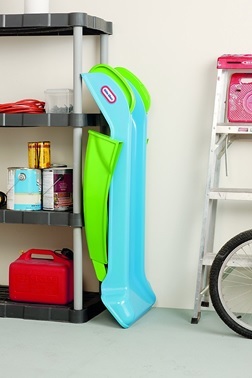 This might also help keep the slide in better condition if it’s kept indoors when it’s not in use. 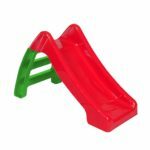 Indoor/outdoor use – You don’t have to depend on the weather with garden slides that can also be used indoors. Usually it’s the smaller slides that are suitable for indoor use as well. Water slide option – Only the Smoby KS Garden Slide has this feature from our table. By connecting the garden hose to the chute water will spray down the slide which turns it into a water slide. This of course is optional, it can also be used as just a normal slide. 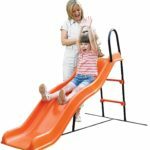 Dimensions – This will tell you the size of the slide when assembled, folding garden slides when folded up would be a lot smaller and more compact. A factor many people like to pay attention to is the height of the slide, this is usually because they want to make sure it’s not too high for their children if they are very young.